June 2- Happy Birthday Mom!! it was so great being able to chat with you over email on your birthday! I hope you had a great one! I didn't do anything too exciting for p-day. we didn't have a zone or district activity cause it was swap meeting. we just did our normal things like cleaning, laundry, shopping and emailing. at 6 pm we had dinner at the Salmons home. that was loads of fun! i love their family! i hope to have a family like theirs when i have my own. after dinner we went to the England's home to have dessert. it was her 10 yr anniversary and her husband was away on a job so we celebrated with her! also we celebrated Sister Dunford's birthday a day early! it was so much fun! she had Popsicle, chocolate cake, and a big cookie cake thing. she also invited her non member neighbor to come over. his name is Carlos and he is super nice and friendly. he was very intrigued about missions and asked us many questions. we were able to share the Because of Him video with him as well. He loved it and thanked us for sharing it with him. that was such a great experience and it helped Sister England see how easy missionary work really is! I love being able to see the members get just as excited about missionary work as we do! this ward is becoming missionary minded!! June 3- today is Sister Dunfords 21st Birthday!! PARTY!! haha she opened up her birthday package in the morning which was fun then we headed off to district meeting. we met as a zone for opening exercises so i asked the ZLs if we could sing happy birthday to her. She wasn't very happy with me hahaha but i couldn't pass it up! we then split off into districts but our district leader wasn't here cause he was waiting in the desert for his new missionary to come on Wednesday so the ZLs taught our training which was really good! we talked about finding out why you are in the area. it was a great training and made me really think about it. there are many reasons why i am in Creekside but i do know that i am here for Jazmin. Its really cool to be able to see that and recognize it. after district meeting we went to the Vondersaars for lunch. the Birthday girl requested her favorite meat lovers pizza from Sams club and they were more than happy to get it for her. We then headed off to see Sister T. she was so cute! she got her a present and everything. it was a scarf cause she has seen her wear scarves all the time! it was very thoughtful. we chatted with her and then had Jazmin pick us up to go get some pedicures! (no worries we got permission) Jazmin pulled up and had her mom in the front seat. she decided to tag along. that was amazing! She has been stand offish but is now opening up towards us. we were so excited and shocked! it was Sister Dunfords first time getting her toes done so that was fun to watch especially when they scrubbed her feet!! she is very ticklish and started crying cause she was laughing so hard! 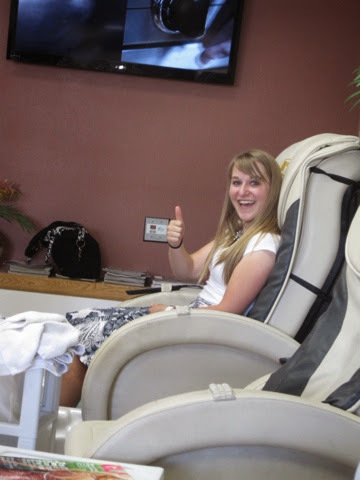 it was so much fun and everyone in the salon asked what we do as missionaries. we love being in public places like that cause people do start to ask questions. after we went to Dawns house for dinner. 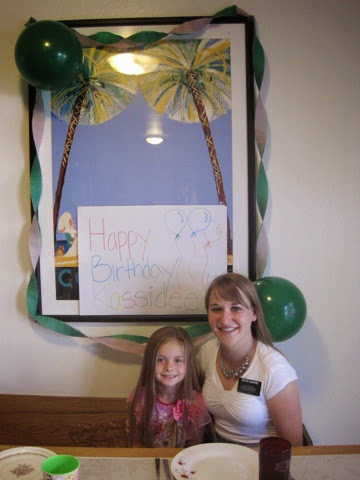 she was so cute and even decorated for Sister Dunford. when she saw that she started crying, it was tender. they were happy tears though! and a little bit of missing her family tears too. we had dinner then she opened her gift, it was a pen and a journal. it was cute! we then had ice cream for dessert! it was such a fun night! Sister Dunford loved her birthday, which was my goal today! June 4- today we had a wonderful lesson with Jazmin. she finished reading the For the Strength of youth pamphlet and had a question about tithing. Sister Dunford and i looked at each other and smiled cause that was the lesson we prepared for her. we gave her the other tithing pamphlet and read it with her and shared experiences about tithing and the blessings we see from doing it. we invited her to live it once she was baptized ans she accepted it! after we worked on her program for her baptism! she is so excited about it and so are we! after we went to Christines and had a lesson with her. sister Buck told us a week or so ago to visit her but she was super busy and finally had time to meet. she vented to us about the trials she is facing right now. we were able to help her see and understand her purpose here and talked about the plan of salvation. she loved it! trials really do humble us all. i am grateful for them because when we are humble we are teachable and able to improve ourselves. we then went to the church to look at our potentials list when we got a text from Jazmin saying she has Mirsa. our hearts sank cause we knew how panicked she must be. having mirsa was one of her biggest fears with this infection she has on her arm. we talked with her on the phone and she was okay. she said she has been praying and full of hope about the news. we were shocked at how well she was doing. we asked if she would like a blessing and she agreed. we made phone calls and found Brothers Salmon and Trask who could do it for us that night. We met at 7 pm at Jazmin and Ivan home for the blessings. It was a great experience for everyone there. they talked with Jazmin and Ivan and explained the priesthood a little more to them. they then gave Jazmin her blessing. During her blessing she started to cry cause she felt the spirit so strong. after the blessing she turned to Sister Dunford and said she was beginning to be like her! haha it made us all laugh!! Jazmin then shared her testimony but not in a formal way. Brother Trask and Salmon were so impressed and looked at us both with huge grins. Brother Salmon then asked Ivan if he would like a blessing of comfort, he accepted. that blessing was very strong and hit on all of his concerns. i just love the priesthood and the power it has. it gave Ivan that confidence he needs and desires. on our way home we stopped by Swarts and talked with her for a little bit. June 5- today we helped clean the hoarders home again. i was in charge of dusting. the dust was so thick it was nasty! i was dusting off the piano and taking things off and i picked up this gold box thing which was super heavy. it had no openings so i asked what it was, still holding it, she says with the straightest face, "oh my mom" , i freaked inside!!! it took all my might not to drop it. YUCK!!! that stuff just freaks me out! its okay i calmed down and kept dusting. i moved to the other side of the piano and found another one! this time i didn't ask who it was. i was just done with the whole piano thing! by the time we left you could see the living room floor and actually feel comfortable sitting in there. we all were so excited about it. after we had dinner at the Delatores and then went to potentials homes in that area. we were able to find Maria! she is interested in learning more but only speaks spanish. the door approach was pretty funny! Sister Dunford spoke all she knew which isn't a ton but way more than me! she was able to tell her who we were. i pulled out a Restoration pamphlet in spanish and gave it to her. as she was looking through it Sister Dunford had a brilliant idea to call the spanish sisters. they answered and spoke with her! she told them her and her daughter want to learn more. it was such a cool experience even if i had no idea what was being said! maria did comment on how i was just smiling and nodding the whole time haha she thought it was cute! i really need to learn Spanish! June 6- this morning the ZLs and our DL and his comp stopped in to give sister Dunford a blessing. it was neat to be apart of. these elders truly care about us! they were texting us as the day went on seeing if we were okay and if there was anything they could do for us. we sure are taken care of out here! We went to the Doctors today and this time it wasn't for me! Sister Dunford had a strange thing on her arm. it looked like my foot with the infection but on her arm and no blister. the Dr didn't look at it all that much, he was more concerned about the flu she has. he prescribed her with antibiotics but told her to wait until the flu is gone. i really don't like the healthcare out here i decided. good thing i wont work here when i become a nurse! we had orders to stay in the rest of the day. in the afternoon i caught the flu too. its a good things sister Dunford and i get along or else it would have been a long few days inside. June 7- we were sick all day. i had it pretty bad but i just slept it off. this weekend was stake conference so we had the Saturday night session to go to. we hoped and prayed to have the strength to go cause Jazmin was planning on going. i was able to get ready in time for Jazmin to pick us up. it ended up being a great meeting! it was all about hastening the work through missionary work and temple work. 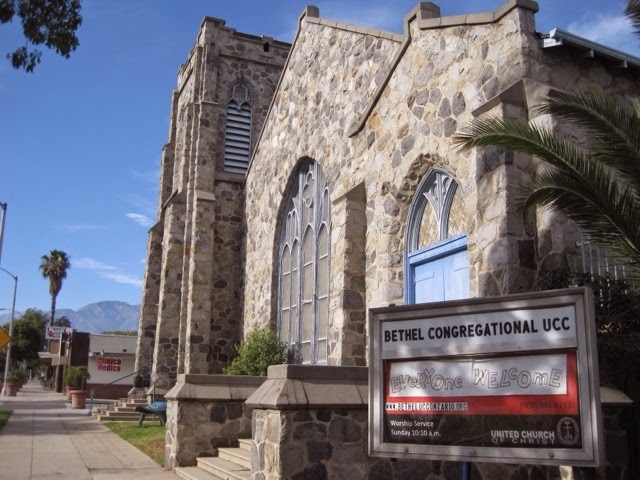 two elders from the 70 were there cause they are reorganizing the stake presidency. June 8- Jazmin came and picked us up for stake conference. we sat with the Dade family. it was a wonderful meeting. Jazmin loved every second of it. we also had Miguel there! Pres Remington invited him to come. oh Pres Remington is the new stake president, he will make a great one! after we went to the Vondersaars to help them with their street BBQ. no one showed up for an hour so it made us all a little nervous that no one was going to show but at about 3 everyone came! there was a great turn out! no one really talked to us at first so it was super awkward but then it got better as the night went on. we left around 5 to go and weekly plan since we weren't able to do it on Friday or Saturday. it was a good thing that we left early cause they all were able to ask questions. Sister Vondersaar texted us to let us know it was a hit! they didn't leave until 7:30 and she said they had great conversations about the church. it was a success! 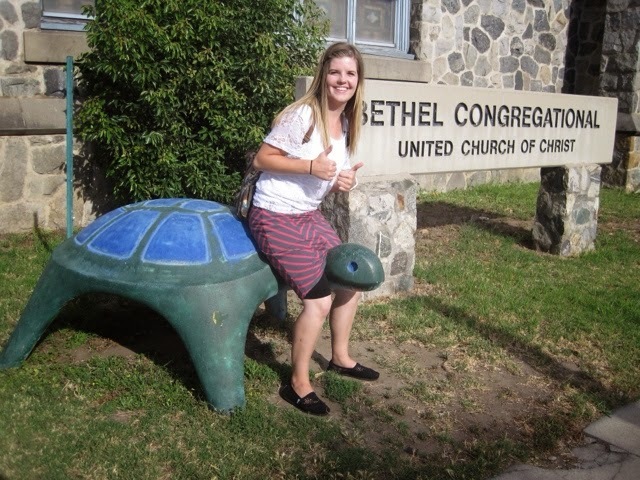 i love seeing members get so excited about missionary work and to realize how easy it really is!! When things don't turn out as we think they should, we must remember that God defines our blessings and requires sacrifice for our sakes. And when we are tempted to quit, we can seek Christ and feel the divine help we call His amazing grace.